The Saab 37 Viggen is an all-weather attack/fighter aircraft. It had Europe's first pulse-doppler radar, and one of only two jet fighters in the world to sport reverse thrust, the other being Panavia Tornado. This version of JA-37 Viggen was manufactured from 1980-1990, and the JA 37D variant flew in the Swedish airforce until 2005. The AJ-37 Viggen was introduced in 1971, the AJS-37 Viggen in 1993. The package contains the variants: AJ-37, AJS-37 and JA-37. Notice that the JA37 is much more accurate and well developed than the other variants. 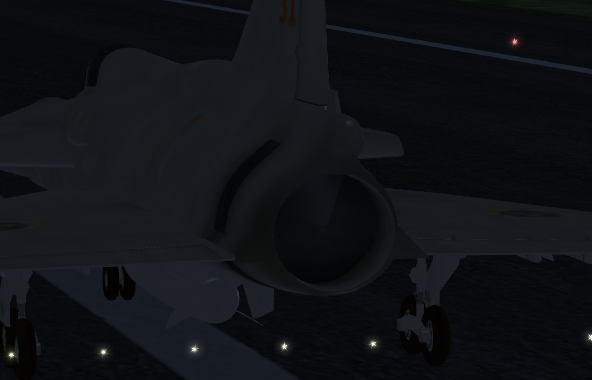 The Flightgear JA-37 version is the JA-37Di variant. 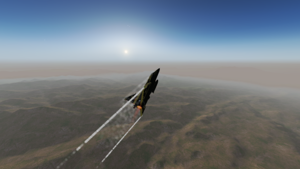 The Viggen is compatible with Flightgear version 2018.2.1 or later. JSBSim FDM based mostly on original Saab windtunnel data. Aerodynamic effect of air intake factor, ground effects and control surface shading. At high alpha asymmetric vortex detachment of left or right side, resulting in adverse effects. Very high alpha handling including realistic departures such as stall, spiral dive, flat spin and inverted spin. Aerodynamic drag from canopy open and canopy detachment. Significantly reduced lift and roll damping when wings detach. Capable of landing with a heavy crosswind. Mach tuck in transonic/supersonic regime. Tuned autopilot based on indicated instrument values, not true values. All settings supported except speed controlled from pitch. A/P can be set to follow other aircraft. Elevon and rudder deflection is limited depending on hydraulic pressure, air density and speed. Filter based pitch, yaw and roll dampers lets the pilot control the plane without adverse effects such as turbulence, dutch roll, accelerated rolls and pitch oscillations which would otherwise be present. Nose wheel steering lock and limiting depending on ground speed. Gear will not retract on runway, and not extend above certain speeds. External power supply truck, generator or reserve generator produces AC voltages. DC voltage converted from AC or from battery. Instrument and landing light dims when not getting enough power and various systems shut down. Two hydraulic systems modeled, the second having a reserve pump. Terrain warning system, with HUD indication and annunciator. Open canopy can be torn off by high wind speeds. Simulated airconditioner unit, which become handy when ice or fog forms on windshield in ALS. 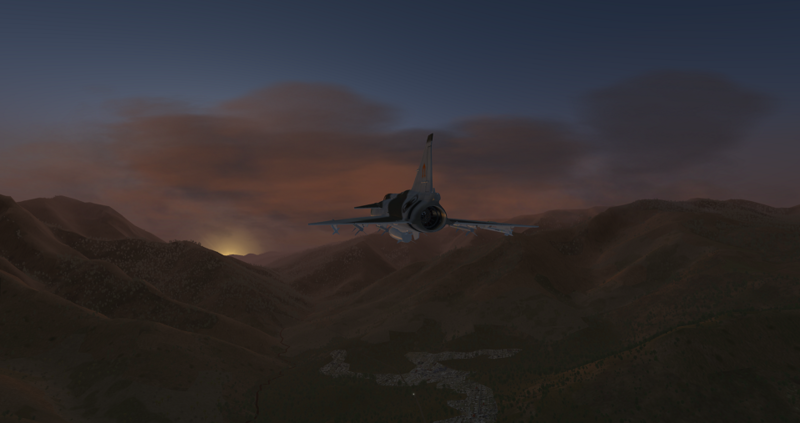 Automated fuel system that works like in the real Viggen. It uses pneumatics, hydralics and electricity. It can be controlled manually also. TILS (tactical instrument landing system) that auto tunes to nearby ILS frequencies. Custom flight recorder records 53 extra properties for accurate replay functionality. Also record fidelity has been increased for smoother replay. 7 internal fuel tanks plus a drop tank that can be jettisoned. 26 extra failures beside the standard ones. Canopy motor, canopy hinges, wings attachment and individual gear locking mechanisms are preset to fail under specific conditions. Engine fire preset to start under certain conditions. Can fail engine if left burning too long. Crash-detection and high-G structural break tied into the failure system; it can randomly fail components proportional to the damage the plane takes. Damage system for getting hit by ordnance. The cockpit features 77 working controls. Gauges are in metric and have Swedish descriptions. But they have Tooltips, showing Imperial and English units. Switches, knobs and buttons have English text for convenience. Custom Canvas HUD built from Saab flight manual with 4 modes of operation: navigation, landing, takeoff and tactical. HUD values depend on indicated values, not real values. HUD can switch between Imperial and Metric units. 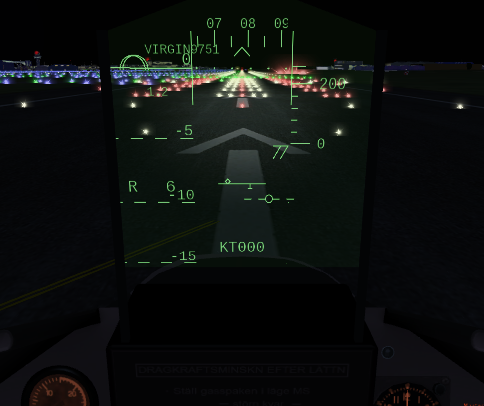 The callsign (or type), velocity vector and distance of the selected track is also displayed in the HUD. It also display nearest tower. HUD shows radar tracks of aircraft plus scenario objects like ferries, balloons, tankers, carriers, tanks, bus, trains etc. 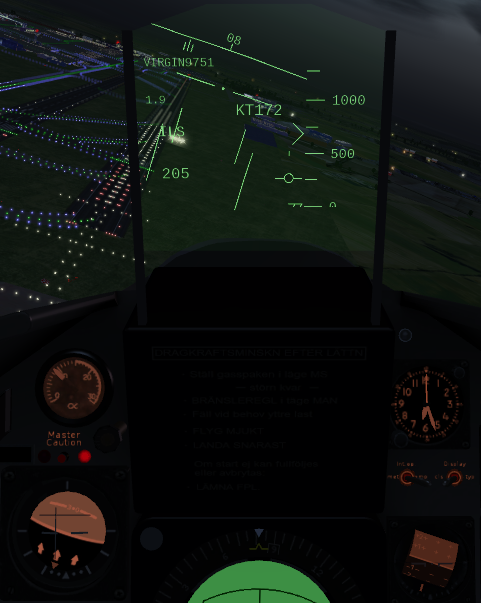 At ILS landings the HUD will show a glideslope guide, if the runway supports it. Also DME if supported and enabled. 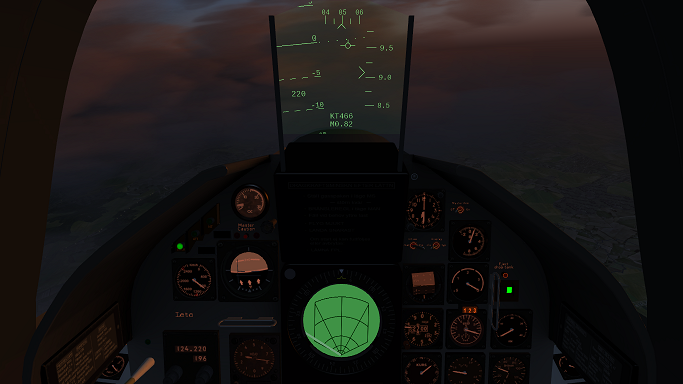 Other HUD features such as distance scale, variant altitude scale, heading scale on horizon in landing mode, diamond at missile lock, altimeter calibration warning etc. Radar with 180 Km (120 Km for AJ37) range that show MP and AI objects alike depend on hydraulic and electricity. In regards to MP planes the radar can be setup to be pulse doppler and/or not able to see through terrain. Auto-start and auto shut down scripts. Realistic modeled indicator panels for various warnings, alerts and notices. Volvo RM-8B (AJ37: RM-8A) turbine with accurate fuel consumption and performance in different air density and speed regimes. A thrust reverser is equipped which require proper hydraulics and electricity to work. Afterburner that has 3 continuous zones of operation. 58 distinct sounds, including 19 annunciation warnings. When canopy is open wind and exterior engine sounds can be heard. No out of place sounds being played at start of sim. When guided missiles hit, the sound is propagated according to the speed of sound at the altitude, and so the explosion will be realistically delayed. Annunciator will warn of incoming guided air to air missile from ja37, m2000-5, f-15 or f-14b. It will also say from which direction. Thunder (when using adv. weather) and rain sounds. JA37: 30mm Cannon with authentic shell properties and accurate recoil. JA37: Unguided rocket pods and guided RB-24J, RB-74, RB-99 and RB-71 air2air missiles, that can be fired at AI and MP alike. AJ37: Unguided rocket and cannon pods and guided RB-75, RB-04, RB-05, M90 and RB-15F air2ground missiles. Plus 3 kinds of sidewinders. RB-24 / RB-24J works as rear aspect only. 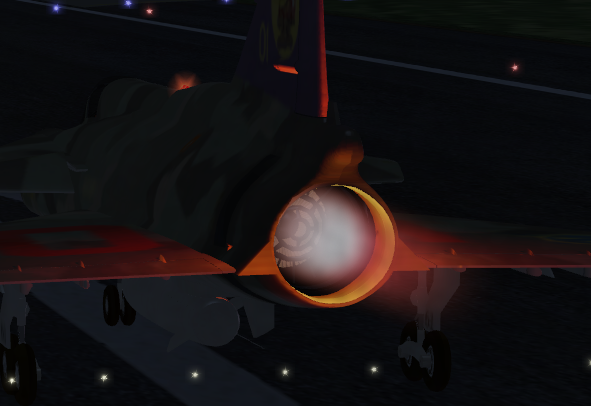 Dual releasing flares that work against RB24, RB-24J and RB74. No longer compatible with the Bombable addon. Sorry. 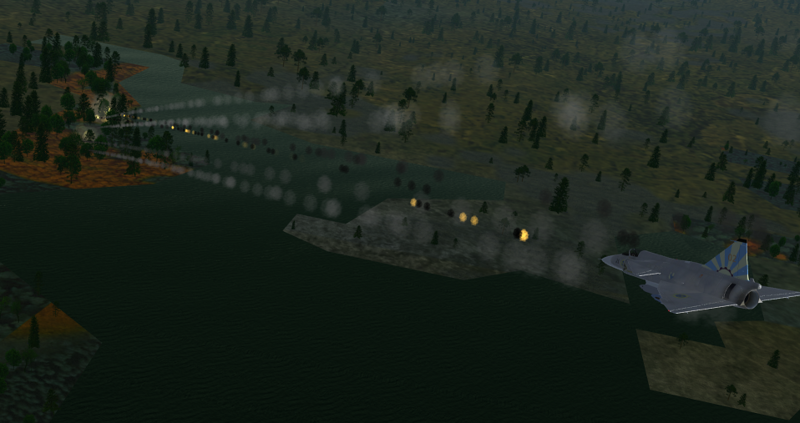 M71 dumb bombs with CCIP aiming. Ability to target a GPS coordinate and fire at it. 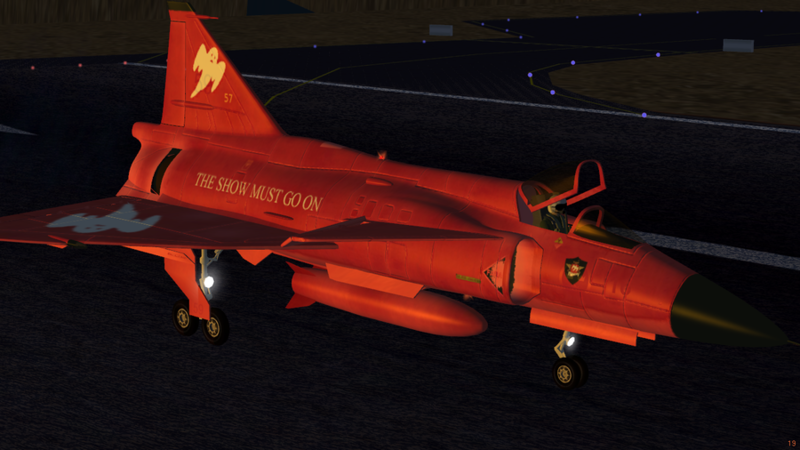 12 authentic Swedish Airforce and 10 fictive Flightgear liveries included. Selection view, with camera pointing to the aircraft from outside and towards the current selected MP/AI aircraft. Ubershaded exterior model and cockpit panels. Also flood light is supported if model shader is enabled. Fully ALS ready and also Rembrandt compatible, but with no light influences. Animated gear scissors, compressions and spinning wheels. Pilot eye view is tuned for getting good view of runways at landings, while at the same time give good view of HUD and instrument panel. Preloaded exterior view, for fast switching to exterior view. Aerobatic smoke in yellow or blue. Wing vapour under the right atmospheric conditions. Under right conditions, contrails will form and if persistent contrail shader is on they will show also. Lights that depends on distance viewed and sun position. Beacon light that simulate rotating beacons. Frost, fog and rain splashes on canopy in ALS. They depend on canopy position, aircondition, outside/inside temperate and dewpoint and rain. Vapour cone in transonic regime. Landing light cone on runway in ALS. Explosion at crash if plane takes enough damage and has enough fuel. In ALS rain drops will form on the fuselage. Buffeting of cockpit view, at high G, on runway, transonic and high alpha, depending on altitude. 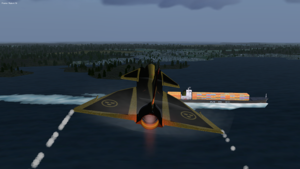 The following is transmitted and shown over MP: Gear compression, flight surfaces animation, afterburner flame, engine flame light, landing light, flash light, beacon lights, navigation lights, canopy animation, canopy detachment, wings detachment, explosion, wing vapour, engine smoke, reversers, frontgear steering, missiles, rocket pods, drop tank, transonic vapour, contrails, aerobatic smoke, external power truck, control surfaces, livery and engine heat blur. 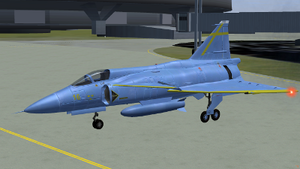 Different Viggen version are to high degree compatible with each other in Multiplayer. 4 Checklists; startup with ext. power, startup with battery, takeoff and landing. Performance monitor with environment stats, aerodynamic ratios, landing/takeoff distance measurement and other interesting values. Systems monitor, that reveals internal systems state. Options panel, with many configurable options. 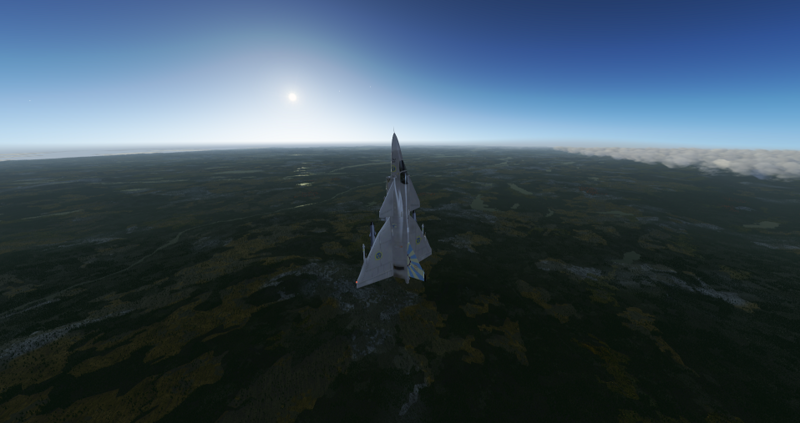 Vapour on the Viggen in a high AoA situation. Frontpanel will full functioning indicator panels. See more screenshot in this gallery here. This page was last modified on 22 February 2019, at 14:47.